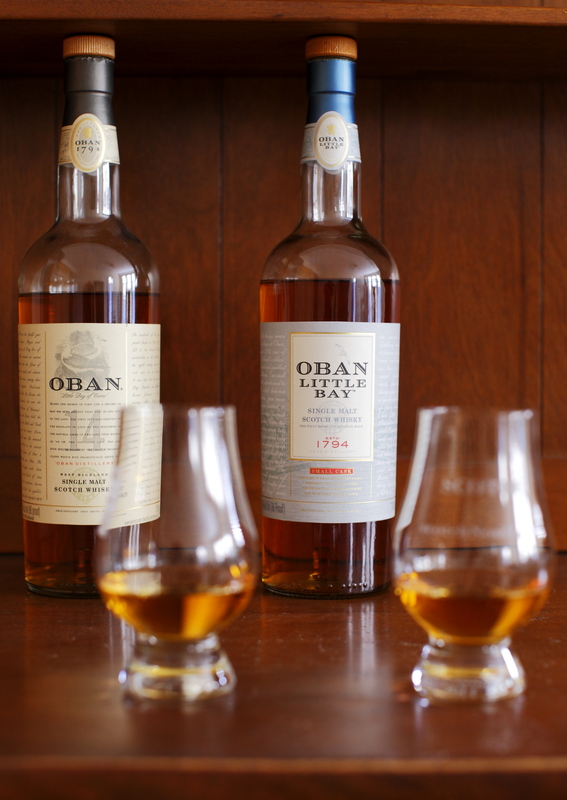 In today’s battle royale, we pit a solid, smokey, 14 yr Oban (pronounced Oh-Bun) with its relatively new little brother, Oban (remember Oh-Bun) Little Bay. Which one will end up on top, which will we be running to the stores to grab another bottle of, or will we want to drink them at all after this review? Color: Both of the contenders in this arena are very similar in color. A light toasted wheat or straw, with the Little Bay having a slightly deeper toasty color, probably from the time spent in smaller casks (a large or rather smaller, depending upon how you look at it, differentiating factor between the two). Nose: Starting off with the Oban 14yr, I’m instantly transported to a sea coast with a little salinity in the air. A low fog of wood smoke rolls over the water, dissipating as it reaches land. I hear seagulls off in the distance. Orange blossom flowers, a rich honeyed stone fruit and white pepper are in the background behind the even layer of smoke. Sweet gentle smoke. Next up is the Little Bay. This nose is completely different from the standard 14yr. Incredibly sweet nose, like stuffing an un-toasted marshmallow in your nose and then inhaling through it. A golden syrup and sultana raisin is nestled in the nose along with mint and a fresh tobacco leaf, not dried and smoked, but a vegetal herbal hint. Going back and forth between the two I find that I enjoy nosing the 14yr a lot more after nosing the Little Bay. A certain kerosene/Sauternes component comes out in the Little Bay that I do enjoy, but find a little harsh. Palate: First up is the Little Bay. Thank goodness the incredible sweetness was only in the nose and not on the palate. Herbal, minty and lemon peel, like you’d have with your morning espresso. A light whiff of smoke just in the tail end while breathing out. The flavor and mouth feel is rich and full and a little bit of wood sourness comes out with it swirling in my mouth. No need for water but a little does increase the floral qualities and lemon. Interesting. Now for the Oban 14! A sweet smokey arrival as it dances around my tongue. Bran biscuits with smoke, honey with smoke and a great creaminess….with smoke. The rolling fog of smoke I spoke about in the nose is ever present but always arriving with another sweet component. Don’t add water to either, just enjoy them neat. The smoke seems to be a delivery service bringing sweets door to door, like a 75 year old smoking-veteran-girl-scout delivering Somoas, Do-si-do’s and Rah-Rah raisins. Finish: The finish on both of them seem to be relatively mid-length. The smoke on the 14 yr stays around for a while even when you brush your teeth before bed, but the spices and sweets leave relatively soon. Where as the Little Bay’s sweetness lingers with the whiffs of smoke near the tail end of the finish. I enjoy the whiffs with sweetness over London Fog. You may be asking yourself, well who wins in the end [Scotch]? And my answer to you would be…. They’re both winners, because they individually cover different spectrums of the scotch rainbow. The 14yr is mellow and full bodied, and the smoke is gentle and welcoming. The Little Bay is sweet and bright with very very light smoke, just near the tail end of the finish. In my opinion the Little Bay is a perfect introduction into the smoke, that the Oban 14yr has to offer. Sometimes it’s not a competition and you should just enjoy both! Slainte!